March 15 - 2 Awesome Rarities In 2 Days! The next day(today), March 15, I left Leamington to meet up with my girlfriend Nadia and my best friend Chris in London, to bird Fanshawe Conservation Area. I must have been distracted thinking about birds or something, because I made a wrong turn in Wheatley and found myself on Talbot's Trail, the slow way to London! Darn, so I figured I'd make a quick stop at Ridgetown Sewage Lagoon before getting on the 401. Since I had not read any rare bird reports from this location in a while, I did not expect much, but I expected at least a variety of migrating ducks or something. I got my scope out of the car and noticed only a small number of ducks and geese, but no swans at all. This was a big change from the 2-4000 swans I was seeing here regularly in December. I noted the small numbers of migrant ducks including Ring-necked Ducks and Buffleheads, as well as a Pied-billed Grebe, then heard something all too familiar to this location: flight calls of Tundra Swans! There were 3 flying towards the lagoon and I quickly noticed that one had a peculiar amount of yellow on its bill. It reminded me of swans I have seen in zoos (but it somehow didn't occur to me that they could be the same species or subspecies). Remember, I was in a big hurry after my mistaken detour to London, so I snapped a photo of it flying and a few of it on the water once it landed, and went on my way. I did not need to do any research to find out what I saw at Ridgetown, because as I pulled into Nadia's dad's driveway an hour later, I read an Ontbirds email by Mike Burrell saying that Ken Burrell and Andrew Dean found it about half an hour after I did! This is in fact a Tundra Swan, but of the European "Bewick's" subspecies, which is extremely rare in Ontario! I heard that this is actually only the third record of this subspecies in the province! Awesome! Birding Fanshawe Park with Nadia and Chris was a lot of fun too. We saw a Turkey Vulture, which are still pretty scarce in the area lately, gave Chris his first chance to have a bird land in his hand, and learned a thing or two about navigation when we realized the trail we were on took us out of the park. Overall, it was a very fun couple of days filled with great birds and great people, like usual! I hope you enjoyed, and thanks for reading! 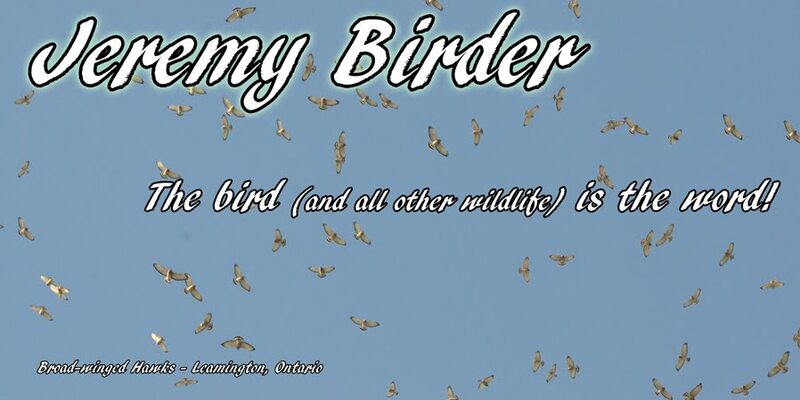 I intended to write this post 2-3 weeks ago when I noticed migration getting rolling, and I even wrote most of a post on the 'blogger app' on my phone, but it appears to have grown wings and flown away(bird pun, lame!). There's a lesson learned once again about trusting phone apps to work. Anyway, I'm sure everyone is well aware that migration is under way! There are Red-winged Blackbirds and Common Grackles (I hadn't seen a single grackle all winter until about 4 weeks ago) singing on nearly every tree or fence post in the Pelee area! Okay, maybe that's a bit exaggerated, but there are surely thousands of blackbirds in the area. I've seen a good handful of Rusty Blackbirds among mixed flocks too, which look and sound really neat. They're sort-of one of the ugliest bird species in my opinion but their ugliness has a certain simple artistic beauty (sorry to get so deep there haha). I read recently that Rusty Blackbirds have faced a population decline of about 85-99% in the last 40 years :0. That explains why I have such a hard time seeing many! I blame the starlings (or the people who brought starlings here); even if this isn't their fault, lots of other things are. Hopefully the RUBL do alright in the future. I have also seen quite a few American Robins in the area, which were extremely scarce through the winter months. My friend Chris who I mentioned in my last post, was asking me 2 weeks ago about differences between Semi-palmated Plovers and Killdeer (the main difference is neck/chest bands: SPPL has 1 and KILL has 2) and the very next day he told me he saw one of these species! I hadn't seen more than a small handful of Killdeer all winter so I headed to that area to see what was cooking: I found 5 Killdeer in one field, and have been seeing them scattered around the Leamington/Essex County area since. Awesome, more migration! Many new ducks have shown up at Hillman Marsh (and are currently present) in the last 2 weeks, including Northern Pintails, Gadwall, American Wigeons, Green-winged Teal, American Black Ducks, Northern Shovelers, Bufflehead, and Ring-necked Ducks. I love ducks! Also on the marsh there were 2 Sandhill Cranes last Monday, March 4 . My girlfriend Nadia and I saw one fly away and heard another making that awesome dinosaur sound they make. I'll have to try to post a nice audio/video clip of one croaking if I find a good chance to film it. The last bird I'll include in my migration report is one of my favourites, and I'm not even too sure if this counts as migration, but I have been keeping an eye out for these and have not seen one in 2 months: Brown Creeper! I was most delighted to see one on a tree near the bird feeders at Ojibway Park in Windsor just over a week ago. I just think they're so cool, the way they disguise so well and shift side to side on trees while acting like woodpeckers. Because of their stealthy ways, there were many times in the fall I would hear their calls surround me out of no where, then move to a different area as quickly as they came, without even seeing the birds. Also, their spring mating songs sound awesome (which I look forward to hearing for my first time soon). I like to think it sounds sort-of like "I am the brown creeper!" I will probably get back to this post to add photos and videos sometime soon. Hopefully my next report on migration isn't so delayed. Hope you enjoyed!